Nothing is black and white when everyone has secrets. Broke and desperate, Kayla Sutton siphons thousands from her employer to pay for her daughter's treatment, but when her boss finds out, he demands repayment...in the form of her submission. What started as a game turns into so much more when the past returns, testing the chains that bind Gage and Kayla's hearts together. She fell for his wicked ways after he blackmailed her, stayed after he kidnapped her, went back to him after he almost destroyed them both with his fury. Now she wants to give him her future. 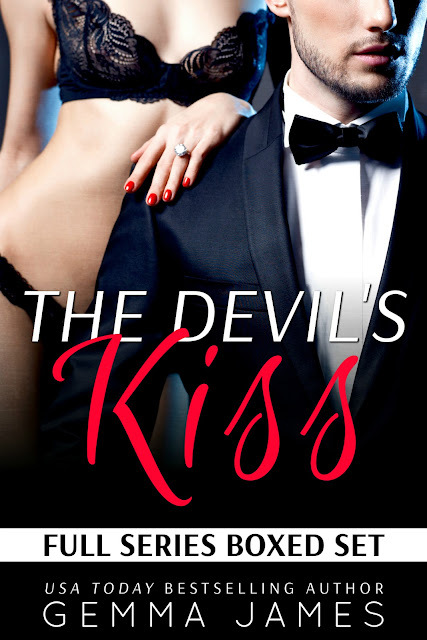 INCLUDES: The Devil's Kiss, The Devil's Claim, The Devil's Wife, The Devil's Spawn, and over 11,000 words of bonus material, including bonus scenes from Gage's POV!